By now, Prosumer needs no introduction around these parts. His reputation as one of dance music’s most celebrated and charismatic selectors precedes him wherever he goes, and his touring schedule has him going everywhere. And while it’s been a few years since he’s released an original production, the few remixes he’s done in recent times affirm what his back catalog already asserts: his excellent music matches his ability to work magic with other people’s tunes. 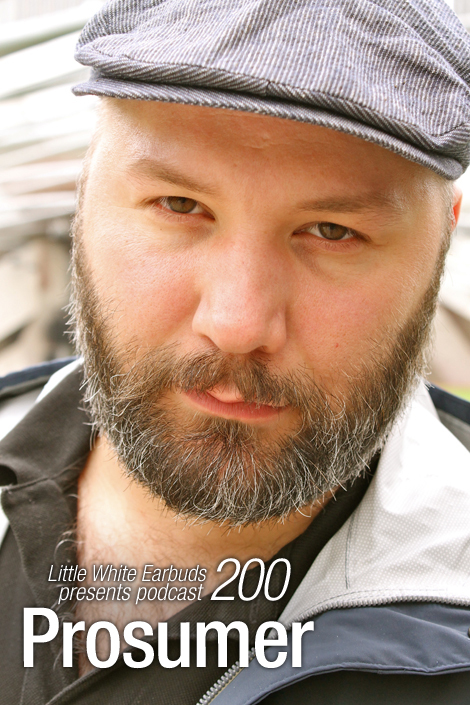 Prosumer (born Achim Brandenburg) was one of the first artists I interviewed for LWE and is someone whose career we’ve followed closely ever since. We recently caught up during his most recent visit to Chicago while dining at Trenchermen, discussing how things have changed since we last spoke on the record; his plans for future collaborations; his experiences in the age of social media; and the interview question which prompted unusual candor from Janet Jackson. There is no more suitable capstone for LWE’s podcast series than a mix from the man himself, and the Edinburgh-based DJ rose to the occasion with a fun and funk filled 75 minutes I’ve been dreaming about since starting LWE. So the last time I interviewed you was in 2008. Achim Brandenburg: Is it that long? Wow. That’s really a long time ago. What about the experience of being a DJ has changed the most since then? It’s getting and harder and harder to play vinyl, because unfortunately the equipment isn’t up to standard in a lot of venues anymore. That is a big change. For me personally, if I look back– I mean, I’m still nervous when I DJ and catch myself having shaky hands and stuff like that, but… back then I was so much more terrified, so much more scared of everything. I think that’s generally the case, as you grow older you just start being more relaxed about things. With DJing, I have so much more fun because it’s so much much more relaxed — I feel so much more secure. A good portion of your music so far has been informed by darker, more depressed times in your life. Do you feel that calmer, happier times will yield different music? The thing is, you don’t change who you are. If you’re dealing with depression, you will still have the dark times, they just won’t be as overwhelming anymore. It changed in the way that I don’t find myself in desperate situations anymore. I don’t find myself in situations where making music is the only alternative to doing something horrible. I think that desperate drive to express myself through music is gone, the rest is — it is still there. There is not only happy music written in my new home, there’s also the blues. You talked about how the desperate drive is gone. That can be a very motivating factor to make music. What is it like not having that pushing at you? The main difficulty with producing music is the issue of traveling. You are away, you get home and basically as soon as you have adapted to being home again you leave again. That’s the main thing which messes with your productivity. From summer on I will take one weekend a month off so I can stay at home for a couple of days longer at a time — to have more time in one bit to work on music and follow the flow of making music. What have you done to maintain a positive work-life balance that being an internationally touring DJ doesn’t usually lend itself to? Moving away from Berlin. It obviously wasn’t working for me anymore to live there because I needed something pretty much the opposite to stay in balance. I’ve seen a lot of my colleagues doing damage to themselves by living the life too fully and burning the candle at both ends. I think most people need time for themselves and really only for themselves. For me personally, I can say it really helps to find the quietness inside myself. The music world we’re living in right now requires a level of social media presence that puts artists and labels at arms’ reach of their fans. What is that experience like for someone at your level? I’m lucky to say that most times that contact is a very moving and rewarding one. If people approach me to have a conversation or take a picture while I’m DJing, it’s not a good time. I’m a private and shy person, so people will notice that also in a club situation I will sometimes be a bit odd because I’m nervous about DJing — it’s not always a good time to talk to me. But when people actually make the contact, that is in most cases just beautiful and rewarding and enjoyable. I think the issue with that is, it changes people’s perception of accessibility and their “right” to access you. In my books, I think DJing is about sharing, it’s about sharing the music. I don’t like the idea of hiding the labels, not telling people what it is, because I still think it’s an amazing thing we can be in a club and share music and enjoy that together, so people should know what it is. But it’s nice to ask, it’s nice to go up to the DJ and say, “What is this?” And sometimes I won’t have the time in that moment so people can come back to me afterwards — right afterwards otherwise it’s too late and I’ve forgotten. When people start putting their phones in your face to record and Shazam it, it’s a bit rude. You wouldn’t walk past your neighbor’s house, open the door, go in the kitchen and taste the food from their pots. Probably if you would ask your neighbors they would say, “Ah yeah, have a go!” and you end up having a nice situation. But you wouldn’t go and just eat their food. And that is the problem, that people assume it’s their right. I have had a bit of negative experiences with press in the last years. The thing with me and Berghain, it’s the story of a breakup. And that was pretty much clear from the beginning, but I was sometimes surprised how much people seemed to think it was their right to know what was going on. That’s where I have to say, it’s a breakup, so there will be two sides of the story. It doesn’t make any sense to have both sides telling you their story because somewhere between that there’s the story. It doesn’t matter! If people choose things to be private, I wish people would deal with it respectfully. So yeah, I think people nowadays tend to be encouraged for a bit of sensationalism. I don’t want to complain because I think usually I have been dealt with really nicely by the media and have had many interviews where it’s a great conversation, I feel understood, and I’m grateful to be able to talk about things. I just think– I don’t want to have to put up more boundaries because people just ignoring that we are all people and we all have our boundaries. It’s never the right of somebody to know something. A large portion of your discography has been done in collaboration with others, like Murat Tepeli and Tama Sumo. What about that process has gotten more music out of you? I’m just an incredibly lazy person. Doing stuff with somebody else forces you to pull through and finish it. It’s as simple as that. Do you have any burning desires to collaborate with anyone else in specific? Nah. I’m pretty sure there are collaborations that would work and there’s stuff I’d like to do, but I’m very cautious. Even though is stuff I’d like to do I’m not one to push it. I’m a worrier sometimes, I worry how things might go. I think things have their time and will happen if they’re meant to be. Maybe that’s again me just being lazy. What about more collaborations with Murat and Kerstin? With Kerstin, it’s a bit unlikely at the moment because of not seeing too much of each other, with her being in Berlin and me in Edinburgh. With Murat, we are just starting the label together and we will start playing live together again. Yeah, it’s pretty exciting for us. It won’t be until much later this year, but we will start playing live together again. And of course that will result in future productions together. It was kind of always clear that we would work together again, more because there is a great link between the two of us. Once every so-and-so years the moon will be right or whatever is responsible for bringing both our strong personalities in one bag and working together. You’re a bit of an interviewer yourself, having been a music journalist for a time and, somewhat recently, interviewing Murat for fabric’s blog. What was your favorite question to ask an artist to get an interesting answer? Oh, there’s not such a thing. No. Honestly, I think it is pretty much down to how comfortable you feel with each other. I once while working at a radio station interviewed Janet Jackson. I had prepared all these questions that were aiming to fit the need of the radio station, something light, bubbly, what the radio station wants and can use in a short insert. Surprisingly, Ms. Jackson answered them in a completely different way than I thought she would. As an example, I asked a question about a reoccurring scene in her videos where she’s hanging out with her friends, very often female friends, just hanging out or partying with them. So I asked her, “I noticed that’s a reoccurring them, is that something you still have time for?” I was expecting something like, “Yeah, me and my girls hanging out, yeah, going to the mall!” That kind of blah blah. Instead I got an answer that friendship is a very painful subject to her because she often finds herself in situations where she realized that people she had considered friends were not actually friends but interested in the star Janet Jackson and not her as a person. She got disappointed a lot and had therefore started closing herself off, was struggling to make friends, and because of that was in a situation that left her sad and isolated a lot of times. Of course that was not exactly what the radio station wanted, but I have to say I was really surprised that I got that kind of answer from her. I think that’s something you wouldn’t have been able to get out of her if you wanted, I guess. If as an interviewer you are willing to listen and are open to what somebody has to say you will get honest answers. It helps if you can pick the people and feel passionate about interviewing these people, and that’s what opens up and gives good answers. Congratulations for 200 Super-Great Podcasts and Interviews. Thank you LWE! Great to have this mix and an interview update, Steve. Thanks much. Link seems to be down ? Thanks for the interview, Much respect for prosumer not feeling too big to play small venues like burgerweeshuis in holland. That tells me it’s all about the music. Much love. Just checked the download link, it’s working fine. Guys, I miss you, the articles, the reviews and the awesome podcasts…. Where’s the rap on Tyree, “Nuthin’ Wrong” from? It’s def. not in the original!